transcended differences of race, culture, ethnicity and religion." "...the concert's highlights were rapturous..."
The second installment of Acoustic Africa's exhilarating musical journey focuses on the richness of the African guitar tradition. The Acoustic Africa tour features Habib Koite, the Malian superstar whose exciting concerts have endeared him to audiences worldwide and a guitarist, singer, and composer from Mali, Afel Bocoum, whose songs evoke the evolution of traditional Malian society. The two artists, backed by a traditional African band, unite in song in a collaborative performance that honors their African heritage while simultaneously pushes contemporary musical boundaries. One of Africa's most exciting performers, Habib Koite plays music that reflects the diverse musical traditions of his Malian homeland. Over the past 10 years, Habib and his band have performed over 600 concerts for adoring audiences in far-flung locations such as Japan, Australia, Brazil and Kazakhstan. 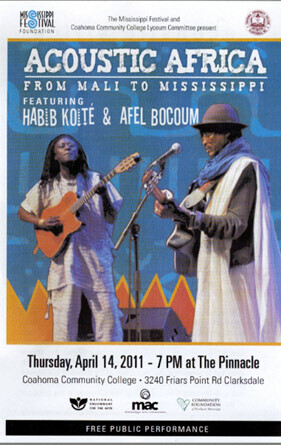 With their engaging stage presence and expert musicianship, Habib Koite and Bamada always put on a show to remember. Afel Bocoum began his music career with his uncle Ali Farka Toure, in his group Asco, a collaboration which lasted some thirty years. In the 1980's, he founded his own group, which he named Alkibar, in which he plays the guitar, composes, and sings. Bocoum sings mainly in Sonrai, his mother tongue, but also in Tamashek, the language of the Tuareg, and in Bambara. With remarkable subtlety and a sure talent, Afel Bocoum has proved that he is a true "Messenger of the great river", and it's certain he will actively contribute to keeping Malian music at the forefront of the international scene.